dimanche 17 août 2014, par Louise Desrenards (Traduction), HAIDAR EID (Auteur) (Date de rédaction antérieure : 28 novembre 2012). And yet, you and your secretary of state, like every US president since 1967, have decided to support Israel in creating conditions that made the two-state solution impossible, impractical and unjust. Et pourtant, vous, comme tous les présidents américains depuis 1967, et votre secrétaire d’État, avez décidé de soutenir Israël dans la création des conditions qui ont rendu la solution à deux États injuste et irréaliste, impossible. Source maannews.net, on November 17, 2009. You will probably not read this letter due to your busy schedule and the huge number of messages you receive from presidents, kings, princes, sheiks, and prime ministers. Who is a Palestinian academic from Gaza, after all, to have the guts and write an open letter to the president of the United States of America ? 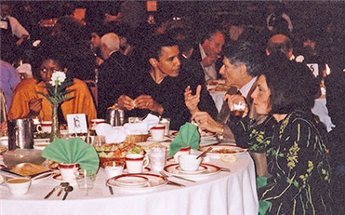 What has triggered this letter is a picture of your excellency sitting with the late Palestinian intellectual Edward Said. That, of course, happened before 2004, i.e. before you underwent a process of metamorphosis which I personally think is unprecedented in history. 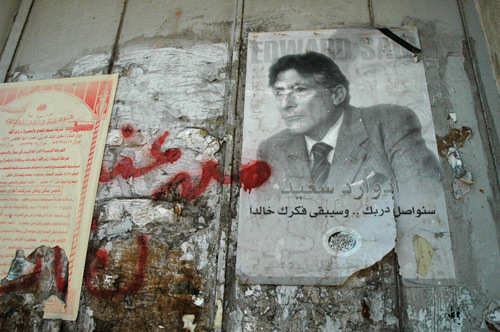 Seeing you with Edward Said, I must say, surprised me. Said, a true public intellectual must have said something to you about the suffering of the Palestinian people. In the picture, you and your wife seem to be listening attentively, and admiringly, to him. But the point remains ; did you really understand his eloquent, passionate defense of the rights of the indigenous inhabitants of Palestine ? Judging from your recent policy shifts, I very much doubt it. It is precisely the incongruity between the photograph and these policy shifts that has prompted this letter. The whole world celebrated your election as the first African-American president of the US. I did not. Neither did the inhabitants of the concentration camp where I live. Your sympathetic visit to Sderot—an Israeli town which was the Palestinian village of Najd until 1948 when its people were ethnically cleansed—three years after your first visit to a Kibbutz in northern Israel in support of its residents, and after your pledge to be committed to the security of the State of Israel and its “right” to retain unified Jerusalem as the capital city of the Jewish people—to give but few examples—were all clear indications of where your heart lies. Another reason for the writing of this letter is shock at the indifference and arrogance with which Secretary of State Hillary Clinton dismissed Palestinian concerns about Israel’s illegal Jewish-only settlements in the West Bank. Only a few weeks ago you made the admirable statement that all Jewish settlement must halt, and you made it clear that this included expansion of existing settlements as well as the construction of new settlements. However, when Netanyahu let it be known that he had no intention of stopping settlements, you missed an historic opportunity to draw a line : no more billions and no more weapons for Israel unless and until this condition is met. Now Clinton has the Herculean task of pretending that your position on Jewish settlements has not changed, although it is clear you have chosen not to use the very real power at your disposal to bring Israeli policy into line. About six months after your election, you gave a speech in Cairo, addressed to the Arab and Islamic worlds ; which some people found impressive. I found it impressive in form, but not in substance because your actions have not matched your rhetoric. Why did I not buy the new language of the new American administration ? Because while you were giving your speech, we were burying my neighbor, a terminally ill patient, who needed treatment in a hospital abroad, since, thanks to the siege imposed by your own administration and Israel on the Gaza Strip, the facilities that would have saved his life are not available in Gaza. Like more than 400 terminally ill people in Gaza, my neighbor lost his life. In spite of the fine Arabic words of peace, “salaam aleikum,” you made it crystal clear that the point of reference in any negotiations in the Israeli-Palestinian conflict is Israel’s security. By doing that, Mr President, you are effectively marginalizing the whole issue of Palestine, and unfortunately setting the stage for renewed Israeli assaults against a starving Gaza, an entity that has, thanks to your “unbreakable” ties with Israel, been transformed into the largest concentration camp on earth. Your failure to support the Goldstone report, your indifference, not to say your contribution, to Palestinian suffering and the process of “politicide” against the Palestinian people of Gaza is, to say the least, unfathomable, coming from a man who listened so earnestly to Edward Said. Your advisors must have told you about the cutting off of medicine, food and fuel to the concentration camp where I live. Patients in need of dialysis and other urgent medical treatment are dying every single day. A majority of our children, many the same age as your two beautiful daughters, are badly undernourished. Unlike your predecessor, you seem to be a smart man. You must have realized that a two-state solution has been rendered impossible by Israeli colonization of the West Bank, by the war on Gaza, by the construction of the apartheid wall, by the expansion of so-called Greater Jerusalem, and by the increase in the number of Jewish settlers in the West Bank. You must have realized also that there are six million refugees, most of whom live in miserable conditions waiting for courageous, visionary leaders committed to true democracy, human rights and international law to implement UN resolution 194. And yet, you and your secretary of state, like every US president since 1967, have decided to support Israel in creating conditions that made the two-state solution impossible, impractical and unjust. Were you a supporter of the bantustan system in South Africa under the apartheid system ? Are you opposed to equal rights and the transformation of Israel/Palestine into a state for all its citizens ? The two-state solution means the bantustanization of Palestine, a solution you, to our knowledge, never supported for South Africa. Are you, Mr President, opposed to civic democracy, which is the demand of most Palestinian civil society and grassroots organizations ? This is what your role models, Martin Luther King Jr and Steve Biko, died for. Was Nelson Mandela wrong to spend 27 years of his life in pursuit of justice by demanding equality for the indigenous people of South Africa ? Do you realize that what you are supporting in the Middle East is a racist solution par excellence ? A solution based on ethnic nationalism. Your secretary of state and envoy to the Middle East, unashamedly, stood with beaming smiles next to Israeli Foreign Minister Avigdor Lieberman, who not only defends openly the ethnic cleansing of Palestinians, but also calls for a new genocide in Gaza. Do you realize, Mr President, that this Hitlerite fascist might become Israel’s next prime minister, thanks to your administration’s complacency and support ? Our only immediate demand is that your administration ensures that Israel fulfills its obligations in terms of international law. Is that too much to ask ? We, the Palestinian people, are fed up ! [bleu marine]Vous ne lirez probablement pas cette lettre en raison de votre programme chargé et du nombre important de messages que vous recevez des Présidents, Rois, Princes, Cheikhs et des Premiers Ministres. Après tout, quel est cet universitaire palestinien de Gaza qui a les tripes d’écrire une lettre ouverte au Président des États-Unis d’Amérique ? Ce qui a déclenché cette lettre est une image de Votre Excellence assise avec l’intellectuel palestinien regretté Edward Saïd. C’est, bien sûr, arrivé avant 2004, soit avant que vous n’ayez subi un processus de métamorphose dont je pense personnellement qu’il est sans précédent dans l’histoire. Vous voir avec Edward Saïd, je dois dire, m’a surpris. Saïd, en véritable intellectuel public a dû vous dire quelque chose à propos de la souffrance du peuple palestinien. Sur la photo, en compagnie de votre épouse, vous semblez l’écouter attentivement et avec admiration. Mais la question demeure, avez-vous vraiment compris sa défense éloquente, passionnée, des droits des habitants indigènes de la Palestine ? A en juger par vos changements politiques récents, j’ai de grands doutes. C’est précisément l’incongruité entre la photographie et ces changements politiques qui ont suscité cette lettre. Le monde entier a célébré votre élection en tant que premier Président afro-américain des États-Unis. Je ne l’ai pas fait. Ni les habitants du camp de concentration où je vis. Votre visite compatissante de la ville israélienne de Sderot, qui fut le village palestinien de Najd jusqu’en 1948, dont sur le plan ethnique la population fut nettoyée trois ans après votre première visite dans un Kibboutz au nord d’Israël à l’appui des résidents, et après votre promesse de vous engager pour la sécurité de l’Etat d’Israël et son « droit » de retenir Jérusalem unifiée comme capitale du peuple juif, pour ne citer que quelques exemples, sont autant d’indications claires de l’endroit où se trouve votre cœur. Une autre raison d’écrire cette lettre est le choc face à l’indifférence et à l’arrogance avec lesquelles la secrétaire d’État Hillary Clinton a rejeté les inquiétudes palestiniennes sur les colonies juives illégales d’Israël en Cisjordanie. À peine quelques semaines auparavant vous aviez fait une déclaration admirable selon laquelle toutes les colonies juives devaient cesser, et vous aviez rendu clair que cela comprît l’extension des colonies existantes autant que la construction de nouvelles colonies ; cependant, lorsque Netanyahu a fait savoir qu’il n’avait pas l’intention d’arrêter les colonies, vous avez manqué une occasion historique de tracer la voie : pas davantage de milliards ni davantage d’armes pour Israël, à moins que et jusqu’à ce que la condition soit remplie. Maintenant Clinton a la tâche herculéenne de feindre que votre position sur les colonies juives n’ait pas changé, mais il est clair que vous ayez choisi de ne pas utiliser le pouvoir très réel à votre disposition pour mettre en conformité la politique israélienne. Environ six mois après votre élection, vous avez donné un discours, au Caire, adressé aux mondes arabe et islamique — et que certains trouvèrent impressionnant. Je l’ai trouvé impressionnant dans la forme, mais pas sur le fond parce que votre rhétorique ne correspondait pas à vos actions. Pourquoi n’ai-je pas acheté le nouveau langage de la nouvelle administration américaine ? Parce que pendant que vous faisiez votre discours, nous avons enterré mon voisin, un patient en phase terminale qui avait besoin d’un traitement dans un hôpital à l’étranger, car, grâce à l’état de siège imposé à la bande de Gaza par Israël et par votre propre administration, les installations qui auraient pu lui sauver la vie ne sont pas disponibles dans la bande de Gaza. Telles plus de 400 personnes en phase terminale à Gaza, mon voisin a perdu la vie. En dépit des belles paroles de paix en arabe « salaam aleikum », vous rendu clair comme de l’eau de roche que le point de référence de toute négociation dans le conflit israélo-palestinien était la sécurité d’Israël. En faisant cela, Monsieur le Président, vous avez de fait marginalisé toute la question de la Palestine, et, malheureusement en préparant le terrain du renouvellement des agressions israéliennes contre la bande de Gaza affamée, une entité qui grâce à vos liens « incassables » avec Israël a été transformée en un camp de concentration qui est le plus grand sur terre. Votre incapacité de soutenir le rapport Goldstone, votre indifférence, pour ne pas dire votre contribution à la souffrance des Palestiniens et au processus « politicide » contre le peuple palestinien de Gaza, est insondable, pour en dire le moins venant d’un homme sur qui qui écouta avec tant d’ardeur Edward Saïd. Vos conseillers ont dû vous parler de la diminution des médicaments, de la nourriture et du carburant, dans le camp de concentration où je vis. Les patients qui ont besoin de dialyse et d’autres traitements médicaux urgents meurent chaque jour. Une majorité de nos enfants, beaucoup ayant le même âge que vos deux filles magnifiques, sont gravement sous-alimentés. Vous devez avoir parcouru le résumé du rapport Goldstone détaillant l’horreur qui fut iinfligée à 1,5 million de civils pendant 22 jours, l’horreur causée par des F16, les hélicoptères Apache et les bombes au phosphore fabriquées dans les usines américaines. Des centaines d’enfants furent brûlés vifs par des bombes au phosphore, les femmes enceintes furent brutalement ciblées à la façon dont les soldats israéliens se vantaient sur leurs T-shirts : « D’une balle, deux tués ». Et pourtant, pas un seul mot de sympathie, Monsieur le Président ! Lors de sa première visite à Gaza Edward Said a du dire ceci : « C’est l’endroit le plus terrifiant où je sois jamais allé... c’est un endroit terriblement triste à cause du désespoir et de la misère du mode de vie des gens. Je n’étais pas préparé pour des camps qui sont bien pires que tout ce que j’avais vu en Afrique du Sud. » C’était en 1993, Monsieur le Président, avant que la situation ne se soit détériorée de façon spectaculaire. Gaza est devenu, comme le leader de l’organisation des droits de l’homme israélienne B’Tselem l’a décrit, « la plus grande prison du monde ». Contrairement à votre prédécesseur, vous semblez être un homme perspicace. Vous devez avoir réalisé que la solution à deux États avait été rendue impossible par la colonisation israélienne de la Cisjordanie, la guerre à Gaza, la construction du mur de l’apartheid, l’extension du soi-disant Grand Jérusalem, et par l’augmentation du nombre des colons juifs en Cisjordanie. Vous devez avoir réalisé aussi qu’il y a six millions de réfugiés dont la plupart d’entre eux vivent dans des conditions misérables, attendant des leaders visionnaires courageux engagés dans une véritable démocratie, les droits de l’homme, et le droit international des Nations Unies, pour mettre en œuvre la résolution 194 . Et pourtant, vous et votre secrétaire d’État, comme tous les présidents américains depuis 1967, avez décidé de soutenir Israël dans la création des conditions qui ont rendu injuste et irréaliste, impossible, la solution à deux États. [bleu marine]Notre seule demande immédiate est que votre administration veille à ce qu’Israël remplisse ses obligations envers le droit international. Est-ce trop demander ? Nous, le peuple palestinien, nous en avons marre ! "Gaza 2012 - Lettre ouverte de Haidar Eid au Président Obama en 2009" de Haidar Eid traduit de l’anglais en français par Louise Desrenards is licensed under a Creative Commons Attribution-NonCommercial-NoDerivs 3.0 Unported License. Based on a work at http://www.criticalsecret.net. Logo : excerpt from Haidar Eid Facebook (Hanzala from Naji al-Ali / Hanzala est un personnage emblématique de la résistance palestinienne, imaginé par le caricaturiste Naji al-Ali, membre du FPLP, assassiné à Londres par le Mossad en 1987). Dès le 11 décembre 1948 la résolution 194 de l’assemblée générale des Nations Unies s’ajoutait à la résolution 181 de 1947 qui divisait la Palestine, afin de palier à la spoliation massive et aux appropriations violentes aux dépens des palestiniens non juifs qui s’en étaient suivies pour constituer le territoire d’Israël, sans droit de retour des populations expropriées, et qui avaient provoqué leur exode de masse , dite historiquement la Naqba, et la première guerre civile israélo-palestinienne (suivie de la première guerre israélo-arabe), de novembre 1947 à 1949. Dans Un cahier spécial sur le Proche-Orient du Monde Diplomatique, à l’article intitulé La Résolution de 194, on lit : « La résolution 194 est adoptée le 11 décembre 1948 par l’Assemblée générale des Nations unies. Elle décide, à la suite du départ forcé de centaines de milliers de Palestiniens : « qu’il y a lieu de permettre aux réfugiés qui le désirent, de rentrer dans leurs foyers le plus tôt possible et de vivre en paix avec leurs voisins, et que des indemnités doivent être payées à titre de compensation pour les biens de ceux qui décident de ne pas rentrer dans leurs foyers et pour tout bien perdu ou endommagé lorsque, en vertu des principes du droit international ou en équité, cette perte ou ce dommage doit être réparé par les gouvernements ou autorités responsables. » ». Littéralement « terre de bantou », les bantous étant les peuples majoritairement natifs et identifiés par la langue commune bantoue, en Afrique australe. Pour information des bantoustans qui ont caractérisé le régime asocial de l’Apartheid en Afrique du Sud, et ailleurs en Afrique, on peut se reporter à l’article de fr.wikipedia.